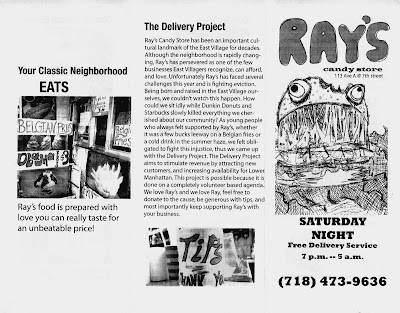 Ray's Candy Store is the latest neighborhood business that is under threat of eviction due to escalating rent hikes. 77 year old Ray Alvarez has had his store at 113 Avenue A for over thirty five years. Now, he is in danger of losing his home because he's finding it difficult to make the rent. 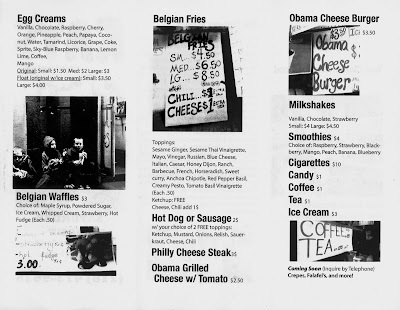 His store personifies what used to be a real neighborhood place. All kinds of people from the elderly Ukrainians, the Puerto Ricans, the hippies, the punks, the yuppies and the hipsters, ecetera etc..all use Ray's Candy Store for food, cigarettes, coffee and to be down right neighborly. It's one of the rare places in the city where all can gather and all can feel welcome. This benefit is in the old rent party tradition of raising money to help one of our own to stay where he belongs, to remain an essential part of the community. Ray pulled a Strawberry ice cream cone tonight . Strawberry being one of the three flavors that he is still able to make . 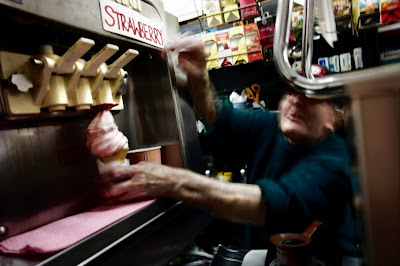 Most of his six ice cream machines are broken with 1/2 of each of 3 machines working . Each machine makes 2 flavors . Ray is now short on supplies . He needs the basics : cigarettes , potatoes , oil ,waffle mix , sodas , etc. . Today it became more difficult than ever to purchase these and other basics , having paid out over $4500 to the landlord and Con Edison . Such is business ; at least the payments ended the court issued dispossess action against Ray and kept the power on so that he can continue doing business . Money is coming in . Ray has customers--3 out of 4 say they saw Ray on the Internet --but just not quite enough of them .The expenses are considerable though . Fines paid to city and state agencies and the considerable decrease in business on avenue A--affecting all businesses on the avenue --have set him back too much .Mayor Bloomberg has taken most of the profit from his cigarette sales . There are more benefits planned for Ray . 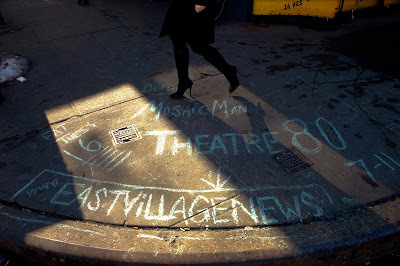 The latest to be announced will be on March 8th at the Theater for the New City on 1st avenue at 10 street . 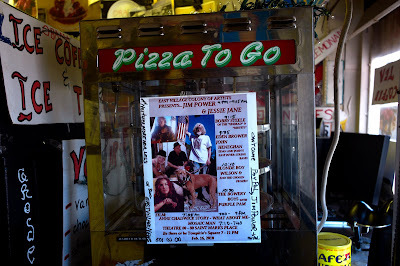 We have heard of one at the Bowery Poetry club too but we don't have any details . As we learn more of the fundraising events we will publish the details . Business has not been good this weekend . Many probably went skiing and not to avenue A . 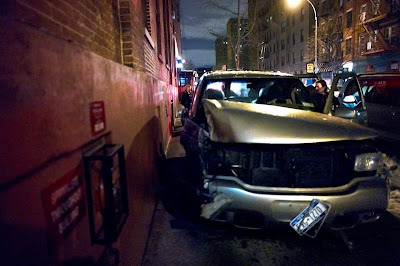 By Sunday night Ray's problems had only grown . There was one brief moment though for Ray to shine and know some joy this dreary Sunday night . A young woman ordered some Belgian fries for her and her friend .During the process of ordering and waiting for fries Ray asked the young woman if she was Persian . Surprised by his perceptiveness she replied yes . Ray spoke to her in Farsi and she answered in Farsi . They both laughed and began a conversation. 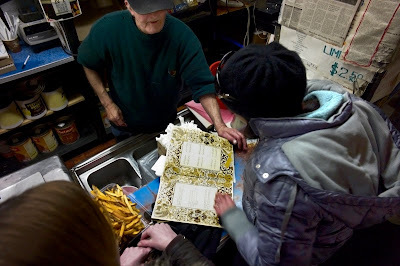 Ray went to the back of his store to get the fries , a large order , lots of fries .He placed the unusually large order of fries before the 2 amazed young women . Then he returned purposely to the rear of the store . Ray reappeared with his cherished , tattered book of Omar Khayyam's Rubaiyat . They read and discussed Omar Khayyam for 20 minutes or so almost entirely in Farsi .Ray even attempted to do some match making for the young woman with a regular male Iranian customer . The young woman declined the offer in Farsi . Finally after the fries were finished and all were smiling the young women paid the bill , left a generous tip and walked out the door into the night . As you already know if you tried Ray's delivery number , the number did not work Saturday Night . According to the delivery team there was some confusion concerning credit card info and thus the phone account was frozen . During a long lasting phone call to India the problems with the account were corrected . The phone will be turned on by Wednesday . There were also some computer problems that made Ray's computer inaccessible . These problems were encountered after the phone problem was discovered .Ray's delivery team hopes to have the computer up and running long before Saturday. Next Saturday Ray's delivery Team will be in place fully equipped , ready to deliver .